It might not fit the mold of a conventional bird vest but Tenzing's Upland Bird Vest sure fits the hunter. This vest-pack crossover comes in a blaze orange style to provide improved comfort and mobility for hunters of every size and shape. Innovative pockets and features have made this award-winning pack an essential bird hunting accessory. It might not fit the mold of a conventional bird vest but Tenzing &apos;s Upland Bird Vest sure fits the hunter. This vest-pack crossover comes in a blaze orange style to provide improved comfort and mobility for hunters of every size and shape. 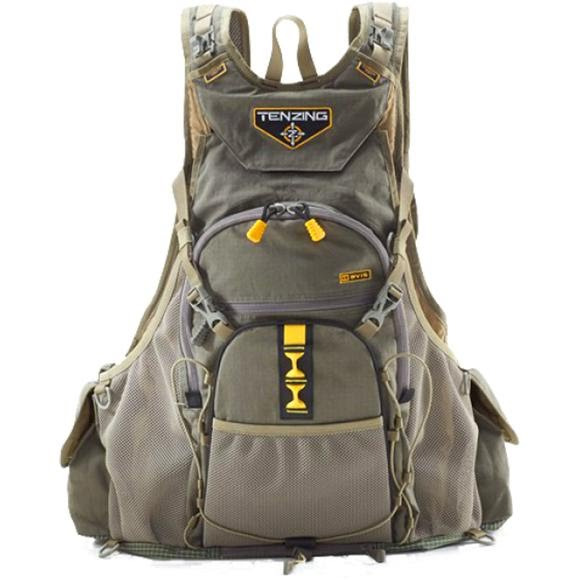 Innovative pockets and features have made this award-winning pack an essential bird hunting accessory. 2x Side Pockets: 8" x 7" x 1"
2x Side Sleeve Pockets: 8" x 7" x 1"
2x Mesh Front Pocket: 3" x 5.5" x 2"
Mesh Back Pocket: 8" x 7" x 1"
Expandable Bungee Compartment: 9" x 11" x 2"
Back Pocket: 9" x 17" x 1.5"
Hydration Compartment: 10" x 16" x 1.5"